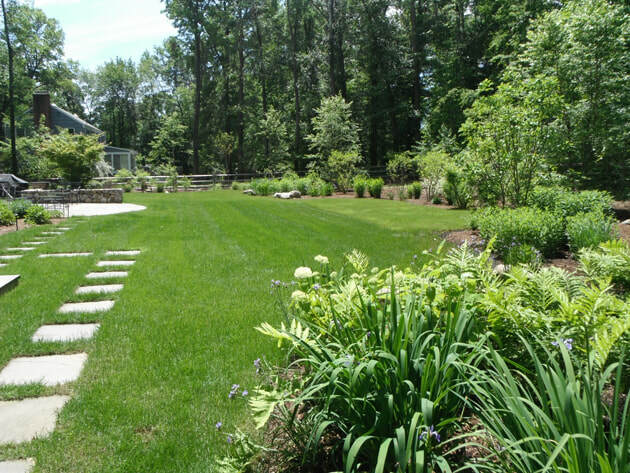 Our team at Growing Solutions Landscaping & Design loved working on this Garden Design in New Canaan, CT. 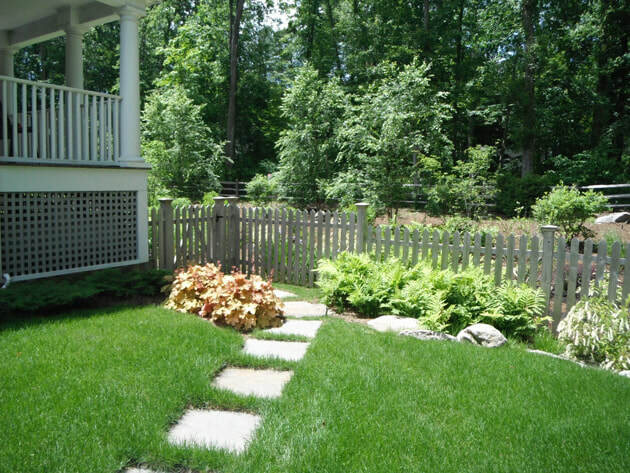 The back yard area of this New Canaan home is a wetland, which suffered from occasional flooding. Working with the wetlands commission the garden was designed to direct and take up water, thus eliminating the flooding problem. A vibrant all season landscape of white birches, drifts of native grasses and perennial flowers conceals the function of the garden, which is to channel water flowing through the landscape. The water flows through the garden, nurturing the wetland flowers, shrubs and grasses. As the water moves through the wetlands it is cooled and cleaned. In flood situations, the dry riverbed of native stone and juncus grasses takes up the water as it passes through plantings of willow shrubs, itea, witch hazel and summer sweet. 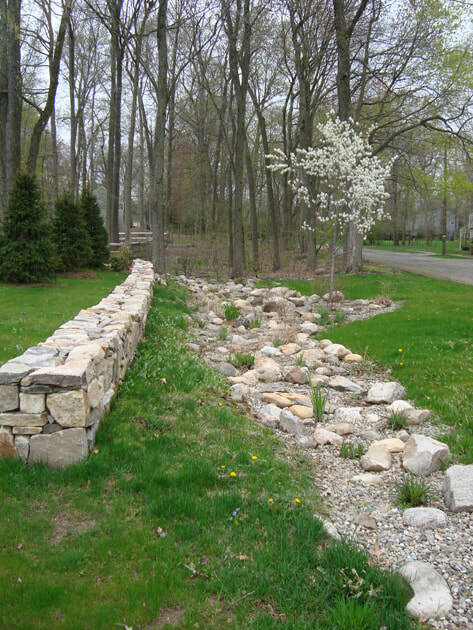 Stonewalls and split rail fencing enclose the garden and protect the plantings from deer browse. The stone patio and stepping stones permit water to percolate through to the soil making a once unusable area a private entertaining area. The garden is a peaceful setting as it functions as vibrant wetlands, inviting birds and native butterflies to thrive. Shade gardens bloom under the mature trees at the woodland edge. Roses and hydrangea bloom in the front of the house where a classic Connecticut landscape frames the house. 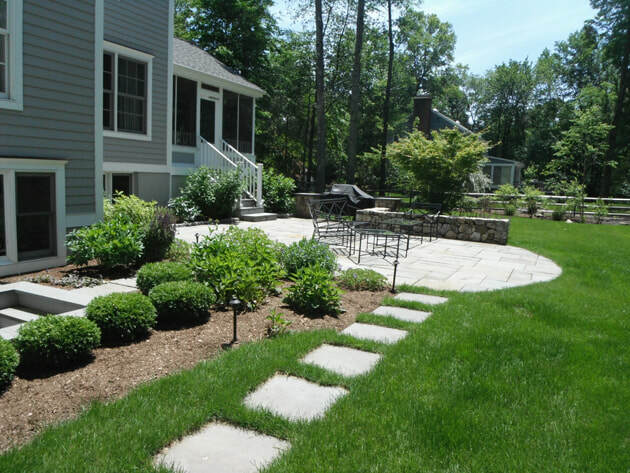 The homeowners at this house in New Canaan we're very pleased with our landscape design team.